Ernesto Bedmar, an Argentinian, graduated with a Bachelor of Architecture degree in 1980 from the University of Architecture & Town Planning, Cordoba, Argentina. He is a registered Architect in Argentina and Singapore. Ernesto's career began in 1977 when he did practical work in the studio at Miguel Angel Roca, Argentina. Between 1980 to 1984, he worked as an Associate at Miguel Angel Roca in South Africa and Hong Kong. ln 1984 he came to Singapore and worked with SAA Partnership until 1986 when he set up his own practice, Bedmar & Shi Designers Pte Ltd and since then has been a Director/Design Consultant at the company. Bedmar & Shi is a Singapore based design practice established in 1986, incorporating a wide range of architectural, conservation, landscape and interior designs. Since its inception, the company has always maintained a staff of twelve, a multicultural mix of personalities from various parts of the world, designers with a singular desire to explore the relationships of buildings to nature with particular emphasis on quality design and execution of its diversified portfolio. Ernesto Bedmar has been faculty at the School of Architecture at the National University of Singapore. 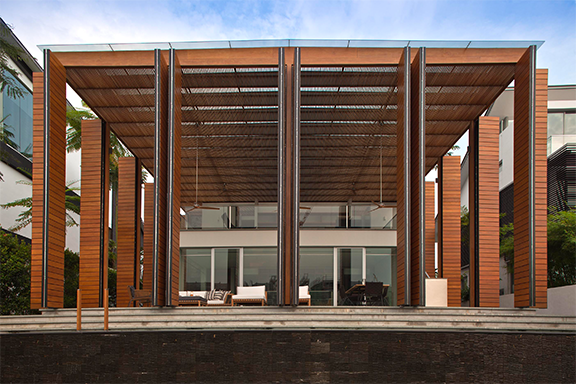 Ernesto Bedmar has received several awards, some of which are the Chicago Athenaeum international Architecture Award, Cityscape Architectural Review Awards and the 10th SIA Architectural Design Awards for Recreational Buildings and individual Houses Categories.